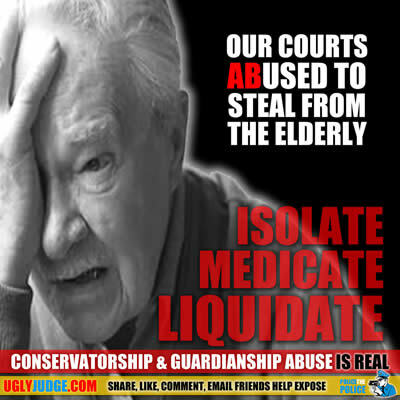 Our Mother was forced into a conservatorship against her will via lies and false statements to cover up over $200k in missing bank accounts embezzled by Sylvia and her husband just prior to the conservatorship. What made this all possible was Sylvia and her lawyer informed the court that they could not contact me and I living in another country and had been disowned by our mother. The court did nothing to investigate, contact me or even ensure the petition was truthful or based on fact. Attorney Christopher Overgaard even went so far as to do an internet search and hired a private investigator to search for me where as he was unable to contact me and told I was most likely living in another country. The truth is Sylvia had always had contact with me and even called me not too long ago. This was all proven to be fraud, perjury and lies in a petition I filed with the court when this came to my attention. To my surprise Judge Candace J. Beason ignored everything. PVP Violet Boskovich who the court assigned to my mother ignored and failed to inform the court of any wrong doing even when she knew something was very wrong. Searching the internet I found this “Abusing and stealing from the elderly was actually common”. Judges like Judge Aviva K. Bobb, Judge Candace J. Beason were common. Dishonest Attorney Christopher Overgaard the coward and con-man he is was replaced with well connected $350 an hour Pasadena California Phillip Barbaro Jr. Imagine Gertrude’s estate would be billed to change from a dishonest $250 and hour lawyer to a $350 an hour lawyer to stop all discovery, investigations and subpoena’s to locate the missing $200k in bank accounts which Sylvia claims never existed. Now why would a court not want to know what happened to two missing bank accounts which Sylvia claimed in her petition the accounts were removed by creditors seeking the money “I owed”. When records show there never was such a transaction by creditors. The truth is Sylvia and husband Gary A. Schmidt pretended to be creditors took control of the two accounts and embezzled the funds, then blamed the missing money on me. Records will show around the same time Sylvia and Gary A. Schmidt via a trust bought property in the Santa Clarita area in the amount of approximately $200k. I gave the missing account numbers to PVP Violet Boskovich and Los Angeles Police department however nothing was done. Fact is when a court is involved Police fail to get involved. When a dishonest judge like Aviva K. Bobb is involved nothing changes. What further is odd is Candace J. Beason is no longer a judge and the Commision on Judicial Performance when informed did nothing. Gertrude’s crimes go unpunished and Sylvia and Gary A. Schmidt just move over 100 miles away to San Diego County to avoid attention. This is going on all over America, the common scam is a judge who rubber stamps everything the criminals and dishonest lawyers do and ignores or questions everything good family members and people who bring evidence to the courts attention.